I recently visited Cambodia to see the incredible Angkor Wat (definitely worth a visit if you can!) 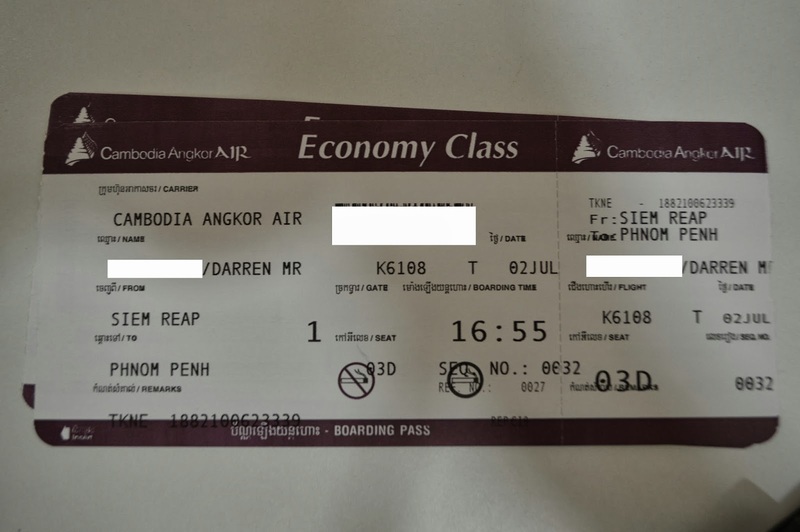 and as part of my trip I needed to get from Siem Reap to Cambodia and since I had very little time, a quick 45 minute domestic flight was the best way to go. Serving this route around 5 times a day is the national flag carrier, Cambodia Angkor Air. The route is served exclusively with ATR72's, a 70 seat turboprop. I took the free airport shuttle from Borei Angkor resort and was delivered to the domestic terminal which is separate to the much larger international terminal. This small terminal serves pretty much the few flights to Phnom Penh and a once daily to the beach resort Cambodian town of Sihanoukville. The country is still very poor so most of the passengers on these flights are international tourists. I paid about USD80 for this 45 minute sector on the easy to use Cambodia Angkor Air website. Check-in was processed quickly and my partner and I were issued boarding passes for 3C and 3D, up the front of the aircraft, although the aircraft doors are at the rear so being at the front means you are last off! We headed through security and into the small terminal waiting area. There are a few seats and a small cafe serving overpriced drinks and pastries! The cafe is operated by a local restaurant/cafe called 'the blue pumpkin'. Unfortunately the aircraft operating our service was quite late arriving which meant about a 40 minute delay for our flight. Originally I was expected a flight in mostly daylight but the sun was rapidly setting when boarding was eventually called. There was also a lot of storm clouds rolling in behind the airport. As it turned out today's flight was being operated by an aircraft in Vietnam Airlines colours, the two airlines are closely aligned with VN owning a large portion of Cambodia Angkor Air... they seem to mix up their fleet a bit. It turned out that nobody was seated in row 1 and 2, and the majority of passengers were sitting at the rear. Another Australian couple were seated opposite us though in 3A and 3B. The other passengers were mostly a Korean tour group and also a group of Australian school children and their minders. Eventually the engines started and the props started spinning. It was getting windy outside as we taxi'ed out to the runway behind a Silkair A320. Looks like a big rian shower out over Tonle Sap Lake! About 5 minutes after takeoff and still in the climb we entered some heavy cloud and we were thrown around in a way that I don't think I have experienced on an aircraft before. I stopped taking photos and started hanging on for dear life. I'm sure the capable pilots up front knew from the weather radar where they were leading us, but for those of us up back it was a scary experience. In fact some of the Korean women were letting out some very audible gasps as we hit lots of turbulence with nothing but heavy cloud seen outside. The woman sitting across from us looked very nervous too and was holding on to her husband tightly. I breathed a sigh of relief as the seat belt sign was extinguished and we continued our climb. I love flying but to be honest I don't really like turbulence. The 3 cabin crew members got out of their seats and commenced the inflight service which was another pastry almost the same as the one I had eaten at the cafe in the terminal! So, 45 minutes after leaving Siem Reap we were on the ground in Phnom Penh. We parked at a remote stand but there was no need for a bus, it was just a short walk to the arrivals hall. I thought Cambodia Angkor Air were a good airline and I can't blame them for the turbulence. Although we were delayed about 30 mins the onboard service was as expected for a 45 minute flight and the crew were friendly. The baggage was delivered quick and I was soon on my way! I wouldn't hesitate to use them again next time I visit Cambodia. Great pictures - another interesting review! Great review! I dont like turbulance in a small aircraft - can be scary! Ive flown on an ATR72 on Vietnam Airlines but I was fascinated this aircraft you flew on was in the old livery, they changed from that livery many years ago! I agree with you about the turbulence, lately i have had a few flights that have been bumpy on the take off and the entire flight, i've put my camera down and held onto the arm rests, which makes me laugh as it never helps the situation. A great write up and interesting to see the ATR in action. For about a year I commuted weekly on the Phnom Penh Siem Reap flight and became a great fan of the little airline. Only once in that time did the flight fail to take off within a reasonable period of the scheduled time. In fact the plane was grounded for the night and after some confusion airline staff shuttled passengers to a downtown hotel. I wondered if your baggage was included in the flight cost and if you needed a multi entry visa to fly from one part of cambodia to another ?